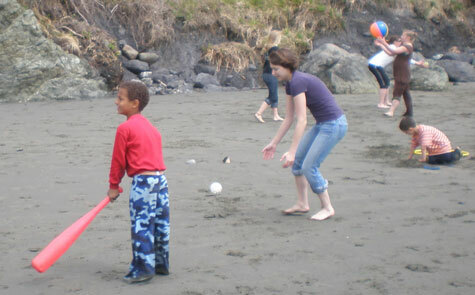 Hand-in-Hand meets the needs of current and former foster families of Humboldt County by providing them with a safe, positive and supportive environment to participate and engage in activities to increase self-esteem, build trust and help develop valuable relationships with consistent adults. Hand-in-Hand volunteers serve as positive role models for the foster families and steady support and encouragement. Both participants and volunteers gain understanding and patience that aid in the development of healthy relationships and augment the emotional growth of all parties involved. 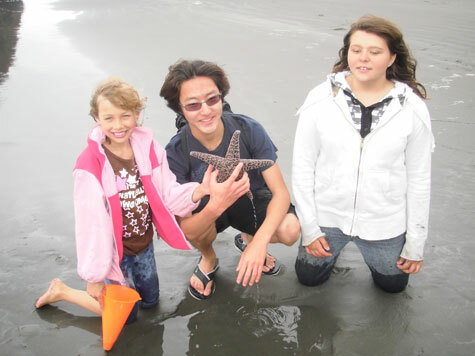 Volunteer and children discover starfish at beach. The program schedules several weekend outings or activities each month to address a wide range of interests. These activities may include arts and crafts and food making projects, games, outdoor adventures, and sports. Weekly service occurs generally on Tuesday evenings and Saturday mornings. Ball games at the beach.